I rarely write product reviews of any sort, so when I see something and decide to write, it’s usually a great product concept that delights me. I just saw a very simple one that both delighted me with its simplicity and solved a simple problem. The Backflip is really simple, and simply a delight. The Backflip is an iPhone case that serves the same purpose as the most popular rubber iPhone cases which have literally sold tens of millions of units. It has the same shock-absorbing qualities as rubber cases, as well as the sticky, non-slip performance so that phone doesn’t move when you put it down. However, the Backflip goes way beyond the basic rubber case in that with the simplest yet ingenuous feature: it has a well-designed pop-out stand on its back. With the stand, you can easily prop up the iPhone vertically or horizontally, making it easy to view videos, pictures, web pages or emails without needing to hold the iPhone. I view all sorts of content on my iPhone all the time, and always get tired of holding the phone. So I either end up laying it down flat – requiring me to tilt my head to see it properly – or having to Macguyver together some odds and ends to prop the phone up so I can view the content. 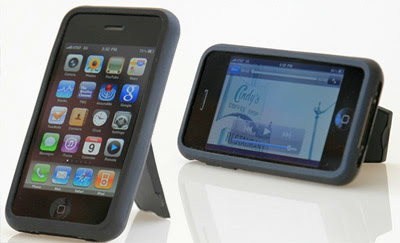 With the Backflip, you simply flip the stand out and voila, the phone is propped up instantly for viewing. There’s not a lot to be critical about with the Backflip, but I’ll make a few observations. The rubber isn’t quite as sticky as most rubber cases, but the stand requires a bit more rigidity to ensure it stays upright. This isn’t a big give to get the kick stand. The rubber on the back side of the case is a bit thicker than the average rubber case, but again, you have to give a little to get some great functionality. Overall, I love the Backflip. It serves the same function as the rubber iPhone case I used before, and it has the added valuable function of including a stand to view content hands-free. Other people love it too: when friends see my iPhone standing on my desk or at a table in a restaurant, they all love it and want one for themselves – it makes that kind of impression. Best of all, it makes that kind of impression without a giant price tag; it’s in the same range as the standard rubber case. Given the combination of form, function and price, this is an ideal gift for the holidays.